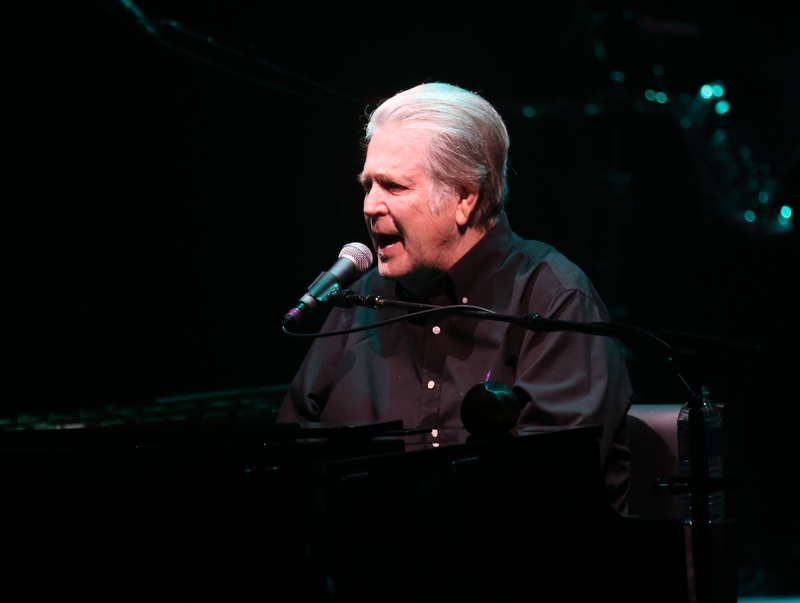 Brian Wilson performs at UB’s Center for the Arts for “Pet Sounds” anniversary tour Wednesday. Fifty years ago, when the Beach Boys released Brian Wilson’s masterpiece, “Pet Sounds,” the groundbreaking marriage of dense harmony and pop hooks caught the B-Boys’ faithful by surprise, and the album was generally considered a commercial flop. This was not the lovable surf-soaked pop the fans had grown to love from the early ’60s forward. The general public just didn’t seem to understand. As Wilson and his band celebrated the album’s birthday before a full Center for the Arts on UB’s North Campus Wednesday evening, “Pet Sounds” still sounded like the soundtrack to a melancholy dream. By now, however, the album is rightly regarded as one of the crowning achievements in 20th century popular music’s rise from entertaining trifle to high art. “Pet Sounds” sounded nothing like anything else released in 1966. In 2016, it still stands as a singular work, and the greatest testament to Wilson’s troubled genius. At 74, after decades battling depression-related illnesses, Wilson is not the same boyish figure we remember feeding barnyard animals on the cover of “Pet Sounds.” He can’t hit the highest high notes any more, but he has assembled a team able to bring the air of the sublime to the music’s live performance – he’s the composer, yes, but these days, Wilson’s voice is but one of many in the choir. Wednesday’s show was all about “Pet Sounds,” but Wilson and company offered a stellar opening set of Beach Boys classics, ranging from ’60s evergreens (“I Get Around,” “Little Deuce Coupe”) to transcendent ballads (“In My Room,” “Surfer Girl”) and, finally, to oft-overlooked ’70s epics, featuring special guest Blondie Chaplin, whose singing and guitar playing during “Sail Away,” “Wild Honey” and “Sail On, Sailor” commingled to end the first set. After a short break, the ensemble – Wilson, the Jardines, Chaplin and, among others, drummer Mike D’Amico, saxophonist Paul Von Mertens, and guitarist Nick Walusko – returned for a full run-through of “Pet Sounds,” aided by stellar arrangements that played to everyone’s strengths. “Wouldn’t it Be Nice” and “You Still Believe in Me” offered flawless vocal harmonies and impeccably orchestrated “chamber pop” from the band; Wilson and Matthew Jardine traded vocal lines seamlessly during “Don’t Talk (Put Your Head On My Shoulder)” and “I’m Waiting for the Day”; and the instrumentals “Let’s Go Away for a While” and “Pet Sounds” reminded us that, even sans vocal harmonies, Wilson’s best compositions are richly evocative and close to peerless. A short set of further Beach Boys favorites – “Good Vibrations” and “Surfin USA” among them, naturally – concluded with Wilson offering a heartfelt “Love & Mercy” as a farewell, concluding a warm, intimate and at times profoundly moving show. This is said to be the last time Wilson plans to perform “Pet Sounds.” If that’s the case, it seems fitting to thank him for this music that has offered a peaceful beauty to the world for all these many years.